The treatments most in demand during holiday season are those for body slimming, cellulite reduction and unwanted pigmentation removal. Surprised? To understand why your pigmentation is getting darker and more importantly and why you should not treat the discolouration of the skin in summer, we will briefly look at the physiology of the human skin. Melissa (in Greek melas – means ‘black’) is a common dermatological condition known as Melasma or Chloasma which primarily affects women. It shows itself predominantly on the face through a symmetrical hyper-pigmentation pattern. This type of pigmentation is permanent. It is more pronounced in summer and lighter in winter. In some cases the neck, chest, and forearms can be affected as well. There is currently no confirmed cause for this condition but multiple factors including ultraviolet radiation, hormonal imbalance, hereditary factors, and/or inflammation have been mentioned in different studies as trigger factors. Ladies who are pregnant may develop “the mask of pregnancy” as well as those on the contraceptive pill or who are changing/stopping use of it. Those undergoing photosensitive medical treatment, such as that for cancer, are also at risk of developing unwanted pigmentation. Most commonly, Melasma triggered by ultraviolet rays (UV) from the sun become apparent the first time when the tan fades. The condition can be psychologically damaging to many people. Melasma is classified by both location and depth of skin penetration. There are three most common areas of the face that may be affected by Melasma: nose and cheeks (centrofacial), cheeks only (malaria), and lower jaw (mandibular). Melasma can be further characterised by the depth of penetration which is often assessed by the illumination of a special lamp and divided into four categories: epidermal, dermal, mixed, and indeterminate. Existing treatments may temporarily improve the skin and lighten the pigmentation, however, the condition often reappears. The main aims of combined Melasma therapy should be protection from sunlight and depigmentation coupled with a lot of patience, a good understanding of the condition and adherence to the treatment routine. There is no complete cure for Melasma at the moment but it is possible to diminish the darkness of the pigmentation. 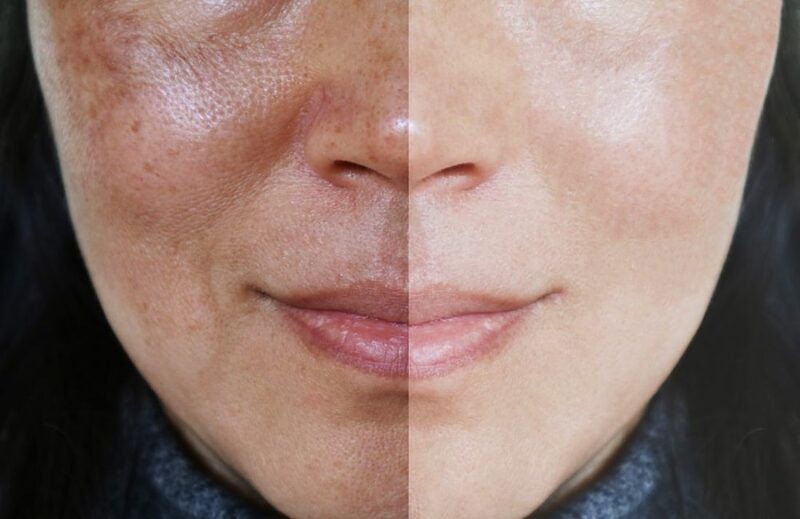 The treatment regime of patients with Melasma typically starts with the management of risk factors, strict ultraviolet sun protection, followed by advanced skin regeneration and/or lightening treatments. All year round and especially during the sunnier months, people who suffer from Melasma should protect their skin with appropriate SPF products which should be at least 30+ in the UK. So what does that number actually represent? This is the amount of time that the cream will protect you in the sun, after which your skin will be sunkissed a bit too much – burned. For example, if your skin becomes bright pink or red within 30 minutes of you being outside on a sunny day without any protection, you can get away without any sunburn for another 30 minutes if you use SPF 30+. But don’t deliberately test it, please. Re-applying your suncream during the day will keep your skin safe and free of sun damage. Unfortunately, a cream with sufficient SPF won’t act as a shield and your pigmentation will most likely go dark anyway. But this is the least that you can and should be doing. Wearing a hat with a wide rim will also be beneficial. You can start lightening your skin with advanced pigmentation removal treatments as soon as the sun loses its activity, usually late autumn. A thorough understanding of the risks and benefits of various therapeutic options is crucial in selecting the best treatment. Usage of the right topical compounds that affect the melanin synthesis pathway, a broad-spectrum protection product is vital not only throughout the treatment but also post-treatment as a regular skincare regime to prevent hyper-pigmentation and reoccurrence. At our clinic we offer the efficient SPF 50+ product which provides not only sufficient protection but also has other beneficial properties. LIGHT PROTECT is a gentle moisturiser, suitable for sensitive, acne-prone and oily skin. It provides high factor UVA and UVB screening and is available in transparent and tinted creams. Glycolic peeling is the treatment next in line for Melasma. It consists of improving skin with the help of a gentle chemical peel which lightens the pigmentation quicker. Agents that accelerate the elimination of pathways for melanin include glycolic acid. This peel is superficial and is typically selected because it tends to have the least amount of risk of complications or exasperation of the pigmentation if there is too much inflammation or irritation. Peels have been shown to be effective especially when used in a series of treatment. Glycolic peels cause controlled exfoliation, followed by regeneration of the epidermis and dermis layers. The strength of the chemical has to be carefully selected and slowly increased to avoid the risk of prolonged dyschromia (hyper-pigmentation). Although we offer 70% strength of Glycolic Peel, it is very rare that we would apply this strength for Melasma treatment. A peel which is too strong and deep can cause worsening of the condition with post-inflammatory prolonged hyper-pigmentation. Instead, superficial and medium-depth peels have been employed with variable success in the treatment of Melasma. After Glycolic peel application, epidermal regeneration can be expected to commence within 3-5 days. Maintenance sessions are necessary. Light assisted therapies, Laser or IPL ,represent potentially promising options for patients who are refractory to other modalities, but they also carry a significant risk of worsening the condition. Lasers have a limited role in the treatment of Melasma as they represent an alternative third-line approach to treat Melasma. 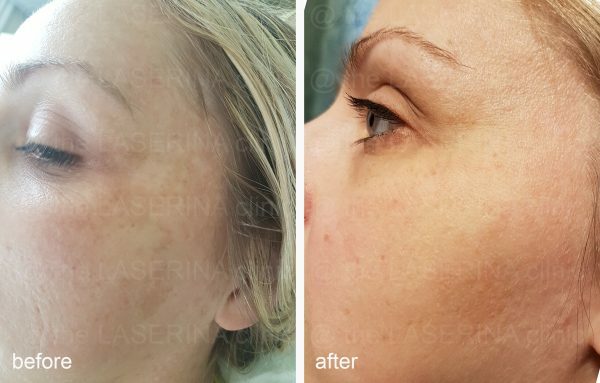 Laser may be partially beneficial for patients with Melasma that is refractory to topical therapy or chemical peel regimens, or when a patient wishes for an accelerated pace of improvement. Analogous to chemical, these technologies accelerate the removal of pathways for melanin but do not target the melanin production itself and are not cures for Melasma. Furthermore, they present a risk for a rebound Melasma flare. IPL therapy may provide improvement in patients with Melasma that are refractory to topical therapy alone but have a modest recurrence rate unless an aggressive topical therapy is maintained long term post-treatment. IPL therapy is best suited to treat patients with Fitzpatrick skin types 1 to 3 because use on patients who have a darker skin type carries with it a higher risk to target deeper skin pigment. A while ago, an increased popularity in treatment of Melasma started to be gained by a new variant of Q-switched and Pico-Laser. However, the idea was soon abandoned following scientific reports and medical conferences. There is often some degree of damage that accompanies sub-thermolytic Q-switched treatment and the high baseline melanoma recurrence rate 3-4 months following the treatment. PRP is a product delivered from blood and consists of high concentration of autologous platelets suspended in a small amount of plasma after centrifugation. Platelets in turn release numerous substances that promote skin / wound repair and regeneration. In aesthetics, PRP is normally used for skin rejuvenation but it can also address issues of different skin conditions and skin health. PRP was the first developed in the 1970s and first used in Italy in 1987 in an open heart surgery procedure. It has since been applied to many different medical fields such as cosmetic surgery, dentistry, sports medicine and pain management. The platelets can stimulate proliferation or fibroblast, epidermal cells, and collagen synthesis. In addition, the transforming growth factor-beta (TGF-B) has been proven to inhibit melanogenesis – reverse skin pigmentation – the exact opposite effect of exposure to UV-B radiation. Typically, patients see the results with 2–3 PRP treatment in the first three months. Clinical studies have shown that it will maintain after six months. Once again, we would like to stress that Melasma is known to occur even after successful treatments. So you must take precautions against it by using sufficient sunscreen with broad-spectrum protection and at least 30+ SPF. Avoiding skin care products that are harsh and aggravate Melasma is also recommended. Based on our experience we cannot state that Dermapen itself produces the lightening effect in the treatment of melasma. However, it’s combination with PRP is the most common therapy for the skin condition. The complex is known to have produced results from a lot of varieties of skin pigmentation, especially when creams and peels don’t have effect. More important is PRPs ability to stimulate collagen production in the area so it tightens the pause and makes your skin glowing. How to book a consultation. You will not be hustled or pushed into buying anything at your first consultation. It is designed and designated to provide necessary knowledge and understanding of the treatment and the technology used to assist you in making your own decision. 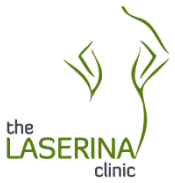 Call the clinic on 01619694190 or email to therapy@laserina.co.uk to book your FREE consultation. From time to time we would like to let you know about our OFFERS and NEWS. By feeling the above form you are giving us permission to add your email to our secure online emailing database. You can unsubscribe any time by clicking a button at the bottom of the email.